Blog Home > Announcement > Palo Alto Networks Now a Four-Time Gartner Magic Quadrant Leader! 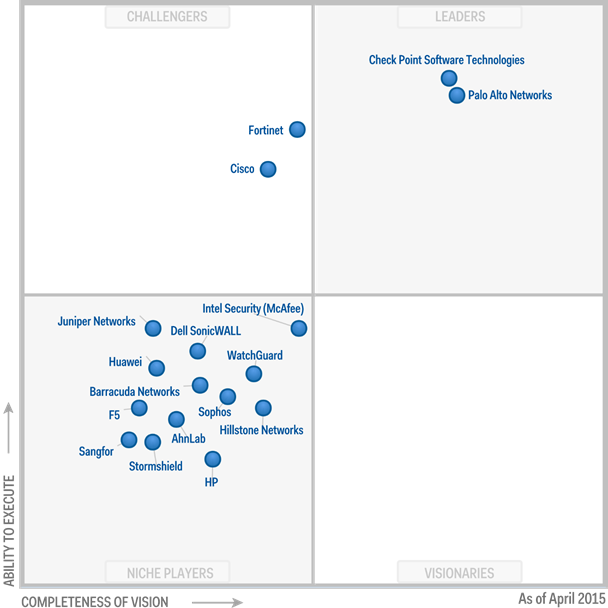 Palo Alto Networks Now a Four-Time Gartner Magic Quadrant Leader! Gartner has just released its latest Magic Quadrant for Enterprise Network Firewalls and once again named Palo Alto Networks a Leader. This marks the fourth consecutive year that Palo Alto Networks has been named a Leader, a designation shared only with Check Point. All other vendors were named either Challengers or Niche Players in Gartner’s four-quadrant system. I invite you to download the report at http://connect.paloaltonetworks.com/gartner-mq-2015. At Palo Alto Networks we have maintained a steadfast commitment to innovation. Just recently we introduced a disruptive new endpoint protection technology named Traps, and a new cyber threat intelligence service named AutoFocus. These new innovations are not only a testament to that commitment, they’re proof points in our continued ability to execute. We believe this record of innovation and execution has moved Palo Alto Networks further along the x-axis within Leaders quadrant. DISCLAIMER: This graphic was published by Gartner, Inc. as part of a larger research document and should be evaluated in the context of the entire document. The Gartner document is available from Palo Alto Networks at http://connect.paloaltonetworks.com/gartner-mq-2015. Gartner does not endorse any vendor, product or service depicted in its research publications, and does not advise technology users to select only those vendors with the highest ratings or other designation. Gartner research publications consist of the opinions of Gartner’s research organization and should not be construed as statements of fact. Gartner disclaims all warranties, expressed or implied, with respect to this research, including any warranties of merchantability or fitness for a particular purpose. Kudos and congratulations to one of our strategic vendor partners! As a progressive County who is continually looking to enhance our delivery of services to our citizens and constituents, partnering with an innovative leader is crucial. Cyber Security is an area of critical focus for all organizations, and our investments must yield the expected return. Over the years of partnering with Palo Alto Networks, they continue to evolve their solutions, through R&D, acquisitions and other means, to ensure that they prove their ability to execute. Additionally, the broad set of solutions they deliver, convey their desire to stay at the forefront of visioning, thus ensuring that the total cost of ownership and return on investment that they provide to companies/agencies are not only competitive, but a true differentiator. Palo Alto networks continues to deliver disruptive technologies that allows me to sleep better at night, and I congratulate them for making the “Leaders” quadrant from Gartner for the 4th year in a row!